Orthodoxy is inseparable from Greece. The clergy and the people, which, in fact, preserved their identity, language and culture over the centuries of the Turkish reign only thanks to the Orthodox faith, which also converted to the Greeks the numerous Slavs and Albanians who settled in Byzantine times in Greece, were always one. This was once again demonstrated by the upheaval of a deal between the left godless God government of Alexis Tsipras and Skopje about changing the name of Macedonia, opening the way for NATO and the EU to take over the Balkans, degraded and broken by the decade-long cruel financial and economic crisis of Greece. According to the Sunday poll of the newspaper Elefteros Tipos, about 70% of Greeks oppose the Presidential Agreement, which is applauded in Washington and Brussels, other European capitals, but which criticizes Moscow. Therefore, it is not surprising that among the participants of the almost 100-thousand protest demonstration in Athens there were priests with icons in their hands, whom the police used to gas with gas on common grounds. Before this, the Holy Kinot of Athos, the “government” of the self-governing monastic republic, called on the Greek and Greek governments to hold a referendum on the Prespa Agreement before it goes to parliament for ratification. 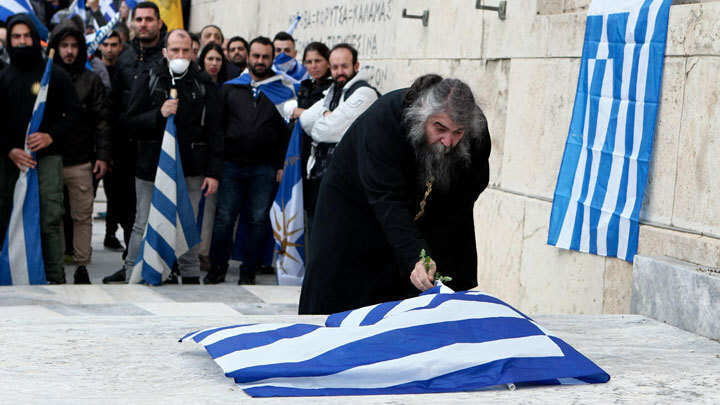 Kinot, consisting of representatives of all 20 Athos monasteries, called the deal with Skopje "ignoring history and truth" and demanded "respect the will of the Greek people", delegating also their representatives to participate in the Athenian demonstration. Earlier, 22 bishops from Northern Greece, which includes part of historic Macedonia with a center in Thessaloniki, signed a statement sent to President Prokopis Pavlopoulos, Prime Minister Alexis Tsipras, Greek deputies and the Patriarch of Constantinople Bartholomew, condemning the Presidential Agreement, expressing his “religious and patriotic protest". Meanwhile, Athens gradually comes to life after yesterday's demonstration, to which, according to the tradition in Greece, radicals clung, whose actions gave the police the desired reason to persecute its participants with tear gas. Dozens of people, including children, have suffered from breathing this poison. 25 police officers who did not allow protesters to the parliament building were also taken to the hospital. According to the General Police Department, 12 people were arrested during the riots, seven of whom were arrested. They threw stones, sticks, smoke bombs and incendiary devices into the “peace officers”. Many observers and participants of the demonstration themselves drew attention to the excessive use of tear gas against the crowd, which included women and children. Apparently, Tsipras and Co. were quite sure that the West would not condemn them for the cruel methods of suppressing popular discontent, as long as they do what they need in the Macedonian question. Indeed, on January 19, an agreement with Skopje on renaming the Republic of Macedonia into the Republic of Northern Macedonia was submitted for ratification by the Greek Parliament, where it will be considered by the Standing Committee on National Defense and Foreign Affairs today. And although the authorities promise not to resort to an accelerated procedure, it is possible that it will be submitted for ratification on Wednesday or Thursday. As promised earlier by the chairman of the 300-seat unicameral parliament Nikos Vucis, the Prespa Agreement will be ratified by the end of this week. Tsipras and Co. expect that they will be able to enlist votes from 151 to 155 deputies. Given that the Greek authorities, as was the case with the corresponding ratification in Macedonia, will be actively helped by the American embassy, which has extensive compromising evidence on Greek politicians, there is no doubt in the "positive" result. Even if the people and the church are against, the parliament will most likely do what Washington and Brussels need. There is no other “democracy,” alas, in the Balkans. Everything will be that way? The decision of the opposition leader, the head of the New Democracy center-right party Kyriakos Mitsotakis who claims to win the next election, to hold a televised debate with Prime Minister Tsipras (SYRIZA) “on the Macedonian issue” will not change anything. Like his proposal to hold early elections. In fact, this proposal does not mean at all that the future Greek Prime Minister intends to completely thwart the plans of NATO and the EU in the Balkans, although it is clear that he will postpone their implementation for an indefinite period of time, whereas it is necessary to hurry. Therefore, Tsipras will not do this. He will not leave until he clears the way for the West to absorb all the Balkans. Moscow: “third Rome” or “fourth Jerusalem”?